Timothy Grabenhofer, the sole owner and proprietor of Gruhr Ltd., opened his business in 1986. Prior to his business venture, Timothy had a 4-year apprenticeship at the largest clock store in the Midwest, where modern clocks and clock kits were sold. At that shop, he was able to develop a wide array of skills while working in the full-service repairs department. Later, Timothy gained additional experience in England, where he completed an apprenticeship under a clock master. This experience specifically taught him a lot about the museum-quality restoration process, which he practices at his own business today. 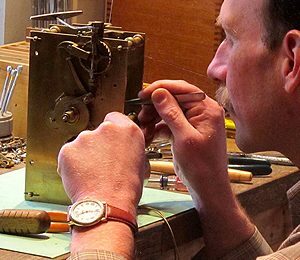 Mr. Grabenhofer has established himself as an expert in the industry, and he can do more than simply repair and restore your clocks; he also has the skills and expertise to create parts for antique clocks and out-of-production clocks. Reach out to us if you have any questions or queries regarding your clocks. Let it be a modern clock or an antique one, Gruhr Ltd Clock Restoration & Repair can help you!